Everything about whitetail season in Maine is big – big deer, big woods and big memories that last a lifetime. 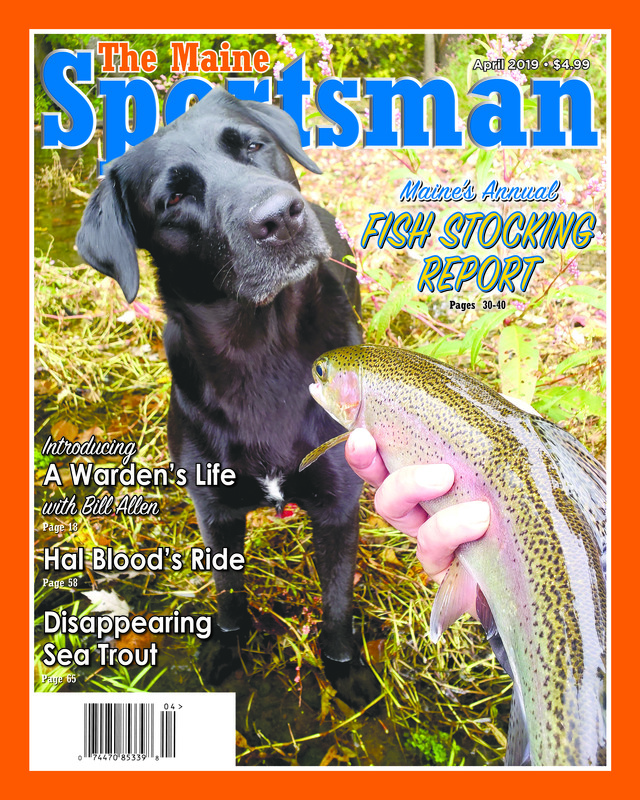 The Maine Sportsman’s February, 2019 annual “Biggest Bucks” issue pays tribute to the successful firearms, muzzleloader and archery hunters who brought home trophy bucks in the fall, 2018 season – with a big 84-page edition! 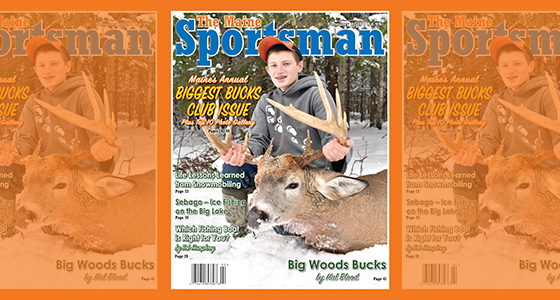 The cover features an outstanding photo by Stacy Bellanger of 14-year old Hunter Dunnels and his 238-pound buck. Another of the issue’s highlights is the centerfold pictorial of the “Top 10 Biggest Bucks of 2018” (page 42), including a monster 300-pounder (field dressed) bagged by Brendan Moore of River Jct., VT in the woods of T11 R17 (extreme southwestern Aroostook County, butted up against Quebec Province). Nine other scale-buster bucks are pictured, ranging from 272 lbs. to 259 lbs. On the six pages that follow are lists of the hundreds and hundreds of other lucky – and skilled – hunters, members of the Biggest Bucks in Maine Club. Congratulations, all! And to help celebrate the hunters’ accomplishments, we unveil our newest monthly column, titled “Big Woods World” (page 41), written by the team at Big Woods Bucks. And our premiere column is from none other than the King of the Big Woods, Hal Blood, who describes his “life-changing” transition from Marine Corps veteran to one of the best trackers, stalkers and shooters Maine has ever seen. The rest of the issue is just as informative and interesting. 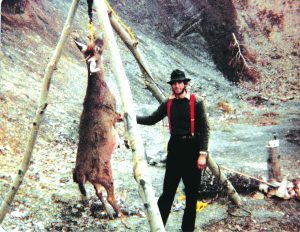 Guest writer and former guide Alan Haley pens “A Shot in the Dark” (page 7), about a memorable time Alan’s friend Wayne Hockmeyer fired at a buck in some thick woods that Alan was walking through at the time. And skilled photographer Aaron Walter Smith’s image of at least six whitetails staring at his camera helps illustrate George Smith’s “Capitol Report” (page 16), in which George laments the cutting of deer yards in Northern Maine and the proliferation of no-hunting signs along the coast that has resulted in overcrowding and tick problems. In “Sportsman’s Journal” (page 9), King Montgomery pays homage to President George H. W. Bush, and his oversized impact on the Kennebunkport area. “41” was an outdoorsman, and in fact the author helped try to push the former President’s 38-foot Fountain powerboat, Fidelity IV, off the sands of Goochs Beach following the vessel’s foggy encounter with the shoreline. 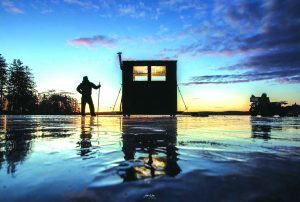 Ice fishing hits its peak now, as the daylight lengthens, and our feature story on sportsman/photographer Jonathan Wheaton page 19) demonstrates the value of arising before the sun to get your fishing gear set up, and also to catch some of the most impressive photos ever taken of Maine’s ice. If you’re not having fun in the Maine outdoors, you’re doing it wrong – at least, that’s the big takeaway from Ed Pineau’s “10 Life-Lessons Learned from Snowmobiling.” And here’s advance notice – the “lesson learned” from each hilarious episode is not the one the reasonable reader would expect! 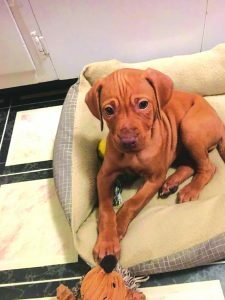 Our regular regional and subject-matter columnists offer informational and entertaining pieces to round out the magazine – from a cute Vizsla pup and New Hampshire’s Averill area, to ice fishing, fox trapping, a partridge-and-apple recipe and proposed baitfish regulations. Throughout the issue, we feature reader trophies and short stories of successful hunts, including the Visconti family’s moose hunt (page 32), and big bucks bagged by Emma Mehuren, John Williams and Kegan McPhearson (page 49), and Patrick Mustoe (page 71). And finally, The Maine Sportsman announces its first Youth Writing Contest, opening February 1 and closing May 15. 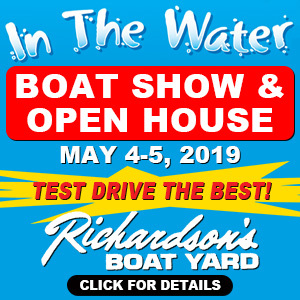 Click here for the rules, and contact the editor for any questions. All kids in grades 6 – 8 are eligible for the Junior category, while grades 9 – 12 will enter the Senior division. $100 first prizes will be awarded for the best non-fiction or essays in each category from Maine and from New England. 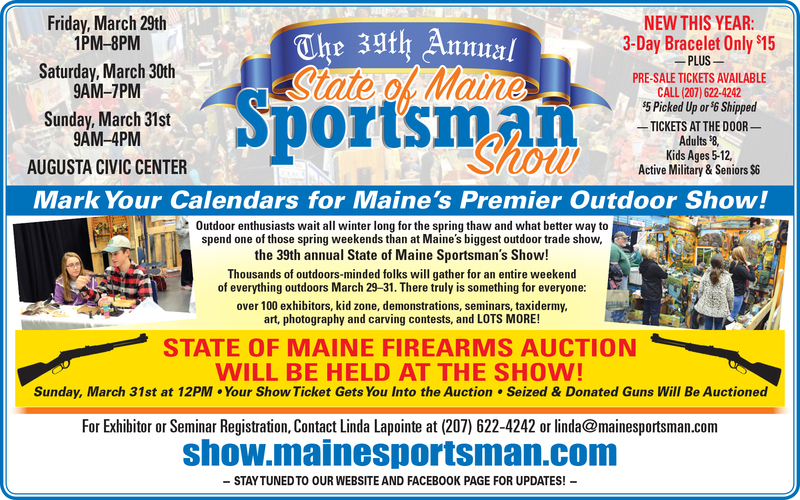 Don’t forget the State of Maine Sportsman’s Show, March 29 – 31, at the Augusta Civic Center. The booth spaces are almost all full already, and we are lining up not only a schedule of great seminars (including some by the above-mentioned Big Woods Bucks), but also, for the first time, the State of Maine will hold its annual firearms auction on Sunday March 31 at noontime at the Show, and it’s available at no extra cost to those who have paid to attend the Show.